The Belgian stop-motion animated film A Town called Panic is out on DVD this month after a theatrical run in October. Unusually for a European film, a pair of British filmmakers have taken on the responsibility of promoting the film here even though they had no involvement in making the film. To find out why, Alex Fitch spoke to Garth Jennings and Nick Goldsmith (a.k.a. ‘Hammer and Tongs’) about their love of simple animation and marketing a film during the demise of the UK Film Council. Alex Fitch: Would I be right in thinking that you guys are the British executive producers of A Town called Panic, or is that too posh a title? Garth Jennings: It sounds fantastic! NG: Yes we are. We’re helping support the film as we love it so much, that’s the main thing. GJ: Yeah, that’s pretty much it. We just really loved it that much. It was odd when we were first asked to consider it, because we’ve always made our own things, but when we saw it, we thought it would be worth doing to try and get as many people to see it as possible. So you basically came to the film cold, you hadn’t seen any of the shorts beforehand? NG: I hadn’t, Garth had. GJ: I’d seen the shorts – I hadn’t seen all of them, I think there were three seasons of the TV series; I’d only seen one and I don’t think I’d even seen the whole season but I liked it. I’ve always loved that style of animation. We’d followed the progress of the film being made and always thought it would be great – seeing it premiered at Cannes, it looked so interesting. I don’t know about you, are you one of those people who looks up trailers all the time? GJ: I used to be addicted! I’m probably the same as you now, but went through several years of always wanting to know what was going on and watching all the clips of new films, and that one was so different and unique. It seems like a film that’s tailor-made for your appreciation. Having seen Son of Rambow, about an amateur filmmaker who’s using the tools available to him, and then seeing some of your more recent pop promos such as the video you made for Hot Chip, which was like an extended episode of Art Attack where the band were making things, it seems exactly like your kind of thing. GJ: Yeah, we’ve done our fair share of in-camera effects and stuff. We’ve always messed about with things like that and it appeals to us. I think it’s not so much the aesthetic as the sense of humour that appealed to us the most, but then I suppose that is tied in to the aesthetic. It’s the way that they’re animated that’s often the funniest thing about the scene. It’s just so clever and endearing, imaginative and funny, but very different to the work we do, obviously because it’s animated. I think there’s maybe a match in sensibilities, an appreciation of silliness. Well, when I interviewed you last about Son of Rambow, we spoke about how that film was very much about the zeitgeist then, the fascination there was at the time with a version of Raiders of the Lost Ark that was remade by kids and people putting that kind of footage on YouTube. The release of A Town Called Panic seems to be coinciding with the increase in makers’ fairs and an interest in craft. NG: In The Hitchhiker’s Guide to the Galaxy we had that section where the crew become knitted and that was stop-frame animation… I think there’s just something more fun in it being in front of you and it being tactile and your being able to touch it and move it. It’s there and you can see the craft of how it’s being made right in front of you. With A Town called Panic, even though they’re very simple characters, the craft is in how well they’ve animated them and how they’ve animated them in a way that’s still in keeping with the structures that they are, for instance a plastic toy whose feet are stuck to the ground together, and that’s how it can then run. I think there’s a charm in that. GJ: It’s true. Even though it’s incredibly clever and complex – there’s 200 models per character – you’re right, it’s something tangible; it’s in the room. There is something nice about knowing that something exists as well, certainly as things become more virtual, it balances it out. It’s like knowing the radio is live – there is something engaging about knowing it’s happening right there and then, rather than it being on the iPlayer. I’m not against all that – it’s great, we’ve used all that technology – but it’s about trying to find the most engaging way to tell a story. The filmmakers have invented their own world over there – loads of their own rules about everything: colour schemes, sounds and voices, everything. It’s very concentrated. Is the version that’s being released in this country dubbed or subtitled? NG: Subtitled. They asked us about that when we got involved and it feels like there’s so much in those voices that are shouting all the way through the film, and the fact that it’s in French actually adds to it. So it was a discussion that we all had but Optimum and everyone thought it should stay the same. NG: They’ll all know how to say ‘horse’ in French! GJ: My kids have all seen it six times! They don’t understand what the words mean in French but they understand what’s going on – they absolutely love it. GJ: Yes, that was lovely, I wish we could have stayed longer, it was really good fun. 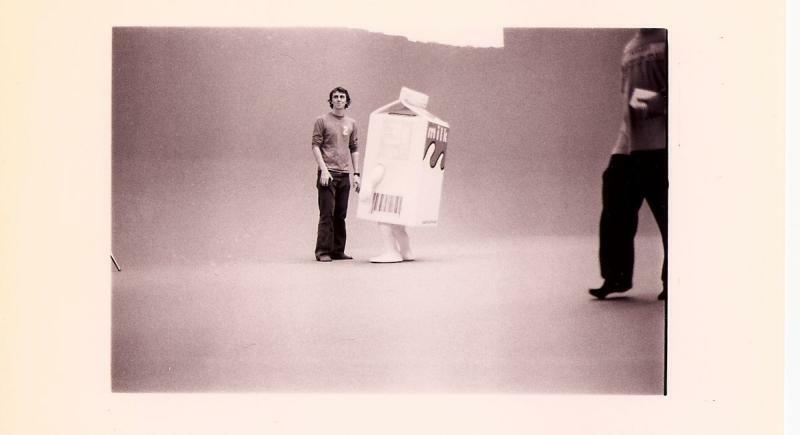 There were quite a lot of ways to promote the film that we came up with, with Optimum. In the past I’ve been used to it being the opposite, you have grand ideas and it’s like: ‘well, that guy wasn’t available, so we’re going to do this instead’ or ‘we didn’t have the money for that, so we’ve scaled it all down to this’… It hasn’t been like that at all – not that it needs a tremendous budget or anything, but we had inventive and funny ideas. It’s got an ambition that film, even though it’s got tiny figures, it’s got a bombastic approach: ‘Right! Now we’re going to go to the Arctic! Now we’re underwater and they’ve stolen the walls!’ We thought that somehow that spirit should be in the ideas we have for marketing the film. So, they range from daft things like making 2D glasses – so that people feel like they’re getting their money’s worth after all this 3D business – through to all sorts of other things that felt like they would have been made by the characters in the film. Did you have many discussions with the filmmakers? GJ: No, the main thing was just to discuss with them that they were OK with us coming on board and it turns out we were both fans of each other, so that worked out! NG: We showed the film at Somerset House on a double bill with Team America – we introduced it there also, videoed it and sent it to the filmmakers so they got an idea of what the screening was like. Was the crowd suitably uproarious? Isn’t what you’re doing with this film – British filmmakers promoting European cinema – part of the remit of the UK Film Council? …not necessarily just you guys, but maybe any successful British filmmakers who are keen about certain subjects, like Guy Ritchie or Michael Winterbottom. Without a government-supported scheme anymore, is it going to be down to British filmmakers to promote films similar to theirs? It does almost feel like you’re starting that process off with this film, however unintentionally. GJ: It is interesting how you get films out there and how people come on board to help. I suppose there are no rules really. I hadn’t thought of it past this, though. You don’t think then that after this film, you might watch other obscure movies and want to help them get released in the UK? GJ: The Horse Whispers of film? That doesn’t appeal to me at all really. NG: Supporting films is brilliant and promoting this one is a joy but what we want to be doing is making films and hopefully having everyone support us. GJ: Hopefully we’ll be getting support in Belgium! How’s the animated project that you’re working on going? GJ: It’s early days and it’s not confirmed yet, but we are putting it all together and it’s very interesting. It’s a new area, even though we’ve worked with animation in commercials, music videos and that sort of stuff. To do a full feature film’s a new thing for us, and also trying to find the language and the style. This is where we’re at, at the moment. It’s experiment time, but it’s going well. A podcast of Alex Fitch’s interview with Garth Jennings and Nick Goldsmith is available at Panel Borders.